Carolyn is a happy, energetic, caring first-grader who just happens to be in a wheelchair. She's excited to start her new year of school and make new friends. Yes I Can follows Carolyn on a typical day at home, at school, and even on a field trip She can do almost everything the other kids can, even if sometimes she has to do it a little differently. 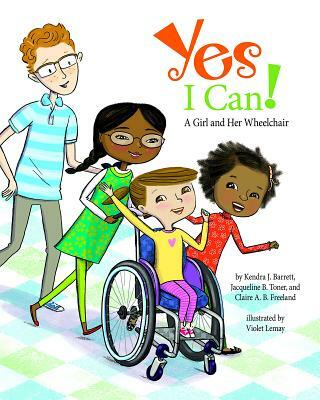 Includes a Note to Parents, Caregivers, and Teachers with more information on discussing disabilities with children and helping them to build positive, empathic relationships. Sometimes, even with answers to questions, some children continue to be reluctant to interact with a classmate with a disability. Encourage your children to smile and say hello. If you are a parent or caregiver, reach out to the parent of the child who uses a wheelchair and suggest a play date. Talk to your child about their reluctance. Help them put their worries into words. It can be easier to address specific worries or questions, like we did above, than an unspecified reluctance. If you are reading this book because your child has teased or made fun of a classmate with a disability, remind them that all children have feelings and that their classmate feels hurt just like your child would if someone teased them. Model kindness toward people with disabilities. Demonstrate making eye contact with and saying hello to people in wheelchairs. With some basic information, and adjusting games and activities so that a peer with a disability can participate, young children can easily learn to make accommodations for peers with disabilities. If you are fortunate enough to guide children in this process, they may surprise you with their motivation and creativity. The experience of working together to solve problems of playing with one another can allow a child in a wheelchair to feel included and provide a learning experience in empathy for classmates.